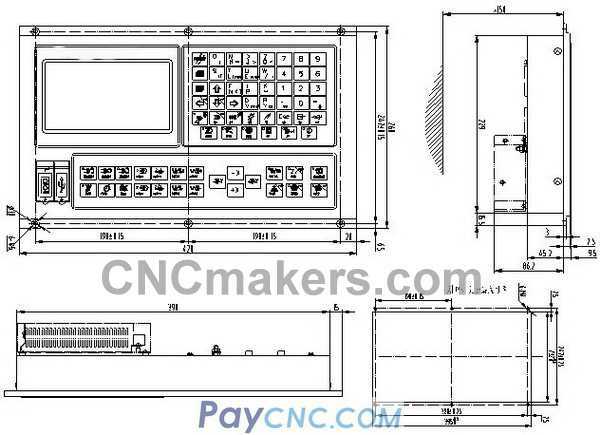 GSK928TD-L turning CNC controller from CNCmakers, uses 32 bit high performance CPU and large scale programmable logic device CPLD control core, realize the level precision motion control. The operation followed the GSK928TE style interface is convenient, concise, intuitive, and has strong function and stable performance. Has the outstanding characteristics in the system operation, safety, machining precision and machining efficiency. Match the AC servo and the company produced driving device, can also according to customer requirements of the configuration of other driving device. 3- Total: 23 - interface input / output 18; auxiliary functions include: 16 position below the turret, spindle, cooling, chuck, tailstock, feeding, lights, automatic lubrication, hand vein, external door, low pressure detection; various devices through the I/O interface can be arbitrarily defined is not restricted, full so far; unused I/O pins can be free to write the M commands to control other accessories. 4- With the largest radius of circular arc processing up to 11 meters. 5- High performance processing system, stable output pulse, uniform, workpiece surface texture, uniform fine connection without meal marks. 6- Efficient processing and real-time detection of flexible parallel processing mechanism; transition segment does not account for time and location; auxiliary instruction instruction can be executed synchronously. 7- Safety measures - maximum: provides a variety of relevant security options, to ensure the safe use; dual soft limiting protection function (machine coordinate soft limit point coordinates + soft limit). 8- With backlash compensation, tool length compensation function, C type cutter radius compensation. 9- Electronic gear function, electronic gear ratio (1 ~ 99999) / (1 ~ 99999). 10- Flexible and diverse functions. 11- Auxiliary calculation function of arc. 12- Short straight line high speed smooth interpolation function: CNC take prospective control way to achieve high-speed transition, the maximum prefetch segment number up to 80 section. 13- MPG has many functions: to control program execution, coordinate motion editing mode in manual mode, automatic program can quickly browse mode. 14- Manual tool adjustment and automatic processing can modify the cutter compensation. 15- Automatic state, can browse the entire process, to see the "information window", M, T function can again repeat alarm. 16- In the implementation of ATC auxiliary function, to observe changes in the process of signal. 17- USB interface: support, processing parameters and cutter compensation program communication; support the overall memory system software and system upgrade. 18- Convenience of equipment management: multi parameter password function with parameter; lock, automatic lock function parameters with total time; curing, curing procedure function. 19- Full screen editing program, check parts in advance, the total capacity of 4400KB, can store 255 part program. 20- Switch - support metric units. Chinese / English / Russian / Turkish interface conversion. 21- Custom instructions, the system reset (M73) / emergency stop (M74) closed when the output signal control unit. 22- According to the moving state limits the input signal of the axis, enhance the safety of the operation. 23- According to the input / output signal state condition control instruction. 24- By 8 foot switch control 8 set of custom instructions to achieve attachment control. 25- In the process of manual shift point, realize the processing of special needs. 26- Can use G38 to set rigid tapping, wire. 27- Perform, real-time change process can separate view important IO signal, convenient debugging function M.
The traditional CNC system instructions are executed sequentially, even if a plurality of instructions written in the same program period, but it is still out of order according to certain rules, called "order process". We note that, in the actual workpiece, and some auxiliary function implementation is time consuming, and no more sequence between the auxiliary function can be executed at the same time, so as to improve the efficiency. The automatic analysis of the logical relationship between the 928TD-L instruction system, auxiliary instruction will automatically disconnected at the same time, so as to improve the efficiency, we call "synchronous process". During processing, servo motor running in low frequency, low frequency pulse output of CNC system is even crucial, because it directly affects the machining cone, arc accuracy and surface roughness. The uniformity of the GSK928TD-L system focused on improving the cutting state of the output pulse, the uniform degree reached the microsecond level; thus improves the accuracy and surface finish cutting the grain problem. After the processing of the spherical end face of comparison, the machined surface is more delicate.